After Kim Jong-un's successful ICBM missile tests, he claims he can now reach the US territory of Guam and threatens to send missiles there to prove it. His rhetoric directed at America has led many scared readers to ask me if World War 3 could be nearer than I thought. The answer is, nothing has changed that could bring WWIII yet. Even for stronger nations, there is just too much to lose in starting a war with the United States. That's why we have not seen WW3 yet. Despite four decades of heightened tensions in the Cold War between America and Russia (1947-1991), World War 3 never came. This effective stalemate continues to this day and is not changing until something big and unforeseen happens. As I explained in a previous article, Russia knows if they destroy America (and the US dollar with it) global economic collapse will result, nearly bringing the end of civilization. That's why the Cold War never turned "hot." Read that article here, especially Objection #1. Until the economic apocalypse becomes unimportant, Russia won't attack. See below for what will finally effect that, something that's not on anyone's radar who has been predicting WWIII unsuccessfully since the late 1940's. As the article below will explain, prophecy says that before America falls a prophet of God will appear and warn the faithful to "come out of her" (Rev 18:4) to save them from the judgment coming to America. In other words, you don't have to worry about America's fall as long as you have not disregarded a true prophet's warning to leave (along with help to do it). For most of my life I have been interested in prophecy and predictions. I wanted to know the future, if it were at all possible. With Bible prophecy and people claiming it was possible, it did not seem foolish to pursue this. I therefore sought out every imaginable source of prediction. I've looked into Nostradamus, Edgar Cayce, the Mayan Calendar, Bible Codes, and many other sources. With most of these, you soon notice that researchers invariably gravitate towards working out doomsday dates or years from these sources and systems. What could be better than to know the year of a terrible event far in advance? Pretty much nothing, so it is hard to blame them for trying. Further, you may have noticed yourself that none of the doomsday dates from any of these sources has ever proven reliable or successful. Personally, I concluded long ago from this dismal track record that setting and watching date-based predictions is futile. Once I realized this, I was set free in a way to see things in the Bible differently. Instead of trying to figure out where in the Bible it had hidden the date or timing of end times events, I began to look for the unique signs it said would herald the end. Ironically, it was only after I concluded this sign (not time) focus was the right approach that I noticed that Jesus had said exactly the same thing in the Parable of the Fig Tree. He said no man knows the day or hour but if you watch for specific events he had described in his Olivet Discourse, it would tell you the end was finally at hand. He said it worked just the same way as leaves on a tree tell you summer is at hand. Luke 21:9-10 (HCSB) — 9 When you hear of wars and rebellions, don’t be alarmed. Indeed, these things must take place first, but the end won’t come right away.” 10 Then He told them: “Nation will be raised up against nation, and kingdom against kingdom. Matthew 24:6-8 (HCSB) 6 — You are going to hear of wars and rumors of wars. See that you are not alarmed, because these things must take place, but the end is not yet. 7 For nation will rise up against nation, and kingdom against kingdom. There will be famines, and earthquakes in various places. 8 All these events are the beginning of birth pains. It takes a lot of time and care to work out what Jesus is trying to say above. For me it only came together after I understood major parts of Revelation first. But even without that, you can see that Jesus is talking about two different periods in this passage. The Long Period Before the End: This time has only wars and rumors of wars, but the end is not yet. For this article, I want to focus on the world war event of the beginning of the end and the other event that we will see must lead up to it. Revelation 18:4 (HCSB) — 4 Then I heard another voice from heaven: Come out of her, My people, so that you will not share in her sins or receive any of her plagues. 8 For this reason her plagues will come in one day—death and grief and famine. She will be burned up with fire, because the Lord God who judges her is mighty. After exhaustive research, I've concluded that this prophecy can only literally refer to the coming destruction of the United States of America. In Revelation 14, the fall of Babylon the Great is tied to the rise of the Beast. The fall is the second angel message (Rev 14:8). The Beast rising and enforcing his mark is the third angel message (Rev 14:9). Therefore if we watch for the Fall of America we will know that the Great Tribulation is coming next. When the Policeman of the World is gone, the lawless ones will be able to do as they wish. In other words, unlike with the first two world wars where America stepped in each time and turned the tide to change the outcome, this time America will be lost and the other side of the world war, the Beast power and the Ten Kings (Rev 17:16-17), will win. They then take over the world to initiate the mark of the beast and Great Tribulation very soon after. That bit of news is of course a major buzzkill. Most readers, particularly Americans like me, are not exactly delighted to learn that America's fiery end is spelled out in Bible prophecy. But the real downer is the doubt in the minds of Americans living there over whether they will be righteous enough, clever enough or even rich enough to take the advice given in the prophecy to leave before it happens and not take part in the destruction! What assurance do any of us have that we can pull such an escape off for ourselves and even our families? Thankfully, we know from the passage above that God clearly wants to save his people, his righteous servants, out of Babylon the Great before she falls, pretrib. He has to make it easy and clear for all to do it since not all are rich, alert, healthy and ready for a journey. His plan is to call out to them to move out of America and then to help them to do so. The parallel in Jeremiah confirms this with its description of “depart from the land” of Babylon (Jer 50:8). If you have the heart to serve God, you do not have to fear missing this prophet's appearance. Nor do you have to fear being able to follow his instructions. When God led Israel out of Egypt, there were poor slaves whom he made sure to enrich on the way out. He also performed miracles on their behalf. The Red Sea parted to let them escape and destroy their enemies. Their shoes never wore out. Bread fell from heaven and water came from the rock. He will do similar assistance again for us modern slaves living paycheck to paycheck or limited in our travel by passports, papers and financial costs (Ex 19:4 = Rev 12:14). “Come Out of Her, My People” - Readers of All Time? The question for us all is when do we obey the "command to depart?" Some think you do it as soon as you become aware of it by reading it. I used to be one of them. When you think it through, the "obey upon reading it" idea does not work. Revelation was written around 17 centuries before America ever became a nation. People of that time had no way of obeying what they read let alone of understanding who it referred to. When a prophecy is sealed like that, many "best guess" interpretations arise. For example, to this day, people allegorize this passage to be about “coming out of false religion.” There has been false religion in Jesus' name to supposedly come out of since before Revelation was written. However, that interpretation does not work for other reasons. The plain literal meaning of the passage indicates a physical place that both wicked and righteous people live in and physically move out of. The consequence of not coming out is to join the wicked in being burned with fire there. Of course, you cannot burn a religion with fire. Nor is a religion responsible for making merchants rich with goods (Rev 18:3). Only affluent industrial nations like America make traders rich. (If you are not convinced, read the 60 Reasons against any other interpretation but America). “Come Out of Her, My People” - Listeners of Future Time! So back to the command to leave America given in the present tense. Again, how can you be told to come out of a nation before it even exists? Obviously, you cannot. However, we should step back and ask, “whose present is it” that the command given in? We've seen that the timing of whenever someone reads the passage does not work. There is a better explanation if we correct the time perspective of the command to America's future, then we solve the problem. America's future is the actual time setting of the passage. When John heard the voice from heaven with the "come out" command, he was viewing a vision of wicked America right before judgment. This command to move out applies to that specific timeframe. John heard the instruction to leave in that setting of when there will be just enough time to flee before the destruction. Jeremiah 51:45 (HCSB) — Come out from among her, My people! Save your lives, each of you, from the LORD’s burning anger. Jeremiah 51:46 (KJV) — And lest your heart faint, and ye fear for the rumour that shall be heard in the land; a rumour shall both come one year, and after that in another year shall come a rumour, and violence in the land, ruler against ruler. Jeremiah confirms that we will have this "rumor" or "report" before the violence in the land comes. The action tied to the rumor is again to move out of the land or to save your life from God's judgment. If these rumors and commands were not to come, how could any of us know when America will be destroyed? We couldn't. As mentioned before, history shows that humans are terrible at intuiting the timing of prophetic events in the future. One thing is for sure, the enemy of America who will bring this about is not going to announce the attack ahead of time. No doubt it will be a surprise attack, perhaps a first strike of nuclear weapons (note: it definitely won't be an economic collapse). Unfortunately, Revelation 18 does not identify the enemy nation. The rest of the parallel in Jeremiah 50-51 does give a clue. It indicates that the fatal attack will arrive from the direct north (Jer 50:3). The map below shows what nations would lie due north from America. Running along this line you first see Canada and then Russia. Obviously Canada is not a nuclear power nor an enemy of the US. Russia is both and, in fact, the "usual suspect" when talking about WWIII. 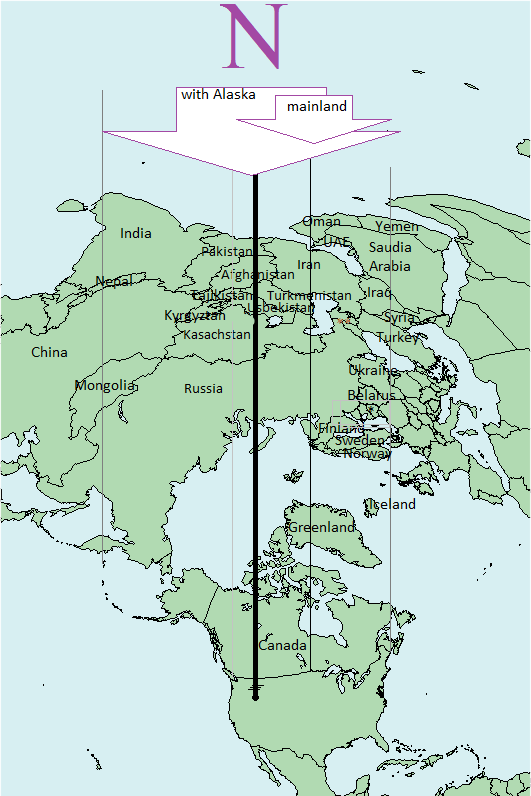 The shortest distance for Russia to send nuclear missiles at the US would be along this line, not from the east or west. A missile attack along this route would only require 30 minutes to destroy the entire US, as Putin once boasted, just as Revelation predicts (Rev 18:10, 17). What's Really Keeping Russia From Attacking? As mentioned above, ever since the Cold War began in 1947, it has seemed that a nuclear World War III between America and Russia was imminent. Yet decades passed and the Cold War ended without the dreaded result. Some would say "M.A.D." is why. That's Mutually Assured Destruction, the concept that "You can't win a nuclear war" as both sides are assured to lose in the event of a exchange using nukes. However, the Russian military does not think that way. Just look at what they are doing to prepare, not what they say publicly. If you listen to the many high level ex-Soviet military defectors, they will tell you their war policy is that a nuclear war is winnable and they still have a plan for defeating the USA with a nuclear first strike one day. If it's true that they know they can win a nuclear war with America, then why haven't they done so already? Because they also realize that in taking out America, they will crash the economy of the world, including their own. This is what Revelation itself says about the impact of America's fiery destruction on the world economy: "no one buys the merchants goods any more" (Rev 18:11). The global economic apocalypse resulting from America's disappearance is why it's not worth it for Russia to attack America (so far). This deterrent will continue until or unless Russia is going to be destroyed anyway. One possibility is if America were to attack Russia first. Of course, this is not at all likely. However, if the situation somehow changes some other way whereby Russia no longer has anything to lose and something to gain by (stealthily) attacking America, then that's when they finally will. That exact change in the current "everything to lose" situation will happen when dwarf planet Wormwood (Rev 8:10-11) brings global cataclysm to planet earth. We all go back to the stone age then and worse with no shelter, food, sunlight, security or hope. When Russia recognizes this opportunity, instead of joining forces with the other nations to try to prepare to survive together, I believe they will launch a sneak attack on America, perhaps when defense satellites are blinded and the pandemonium has America's military distracted. Russia would do so before they lose their nukes to the earthquake and meteorite pelting from Wormwood. They would have nothing to lose with civilization coming to an end anyway, and something new to gain. Wormwood will not directly impact Earth and life will go on even if civilization as we know it will be over. 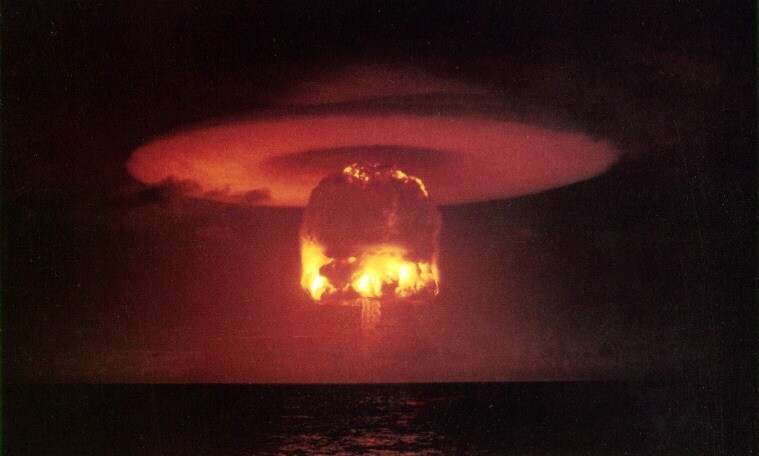 An effective preemptive nuclear strike on America will once and for all eliminate the obstacle to Russia's dominion. The other reason they will do it is because the Illuminati/Ten Rulers have been planning to take out America and waiting for their opportunity since they hate America (Rev 17:16). Because this ultimately fulfills God's will to judge America (Rev 17:17), God allows Satan's evil forces to persuade and help Russia to pull it off. Until Wormwood is about to hit and bring "the end the world as we know it" (TEOWAWKI), Russia continues to have something to lose. Russia will therefore continue to tolerate the annoying existence of America thwarting their ambition to rule the world. Where is Wormwood now? How close? Nobody can (or will) tell us how close Wormwood is yet. (Please ignore any and all YouTube videos you see claiming to have pictures or evidence of it.) That leaves it to God to take care of warning us about WWIII, with enough time for us to do something. This is exactly what Revelation 18:4 promises as the next section explains. About That "Voice From Heaven..."
So how will this voice from heaven work from our perspective exactly? Will all the world hear this same voice from heaven that John heard? That is highly doubtful. Only on rare and special occasions do people hear voices from heaven. The only time heaven has spoken to the masses was when the nation of Israel was called into a covenant with God. Apart from that only the righteous and perhaps a few with them (Paul or Job with his friends) have heard from heaven. Instead, the standard method God uses is to send a prophet to deliver his revealed Word. When God wanted Israel to prepare to leave Egypt, he did not yet opt to speak to them from heaven. He instead made Moses his prophet, speaking to him from the burning bush, and sent him with his word to Israel. And he did not send him empty-handed. He equipped him with supernatural signs of his authority. These included the staff that could turn into a serpent, his temporary-leprous-hand-from-inside-the-cloak trick, and turning waters to blood. As with doomsday dates, the past is the best indicator of the future, especially with God who says he does not change. The precedents of his dealings and operations in the past tell us how he will operate again in the future under similar circumstances. The Book of Revelation gives us a great outline of future events but leaves many details unclear. This is one way the book has been sealed. It is up to us to fill in the details through understanding the lessons and precedents of the preceding 65 books in the Bible. If God is going to get his people to know that they have to move, he will send a prophet to do so. We have not seen a prophet like this since the New Testament canon closed. Yet there is a prophecy of such a prophet coming in the end time. It is the prophecy of Elijah coming before the Day of the Lord (Mal 4:5-6). Matthew 17:11 — He answered, “Elijah does come, and he will restore all things. Plainly, Jesus said there is another fulfillment of Elijah coming that better fits “before the Day of the LORD” who will "restore all things." If Jesus comes twice then it would make sense that his forerunner who prepares people for repentance would come twice, too. Each generation needs the repentance message. John even denied being Elijah when asked. Either he lied or he was interpreting the question asked as indicating the Elijah who comes before Messiah comes to reign, which is exactly what the Jews were expecting then. But John was the Elijah who comes 2000 years before at the First Coming. Perhaps for this reason he said he was the "voice of one calling in the wilderness" instead of Elijah as the angel Gabriel pronounced to his parents. Calculating and watching dates by the calendar has never worked to predict or tell us about the end. Jesus focused on a few specific prerequisite events in prophecy that must be fulfilled before the global time of trouble is upon us. America's fall is (unfortunately) one of those events. Given that God clearly wants to save "his people," a related end time event is the necessary sending of a prophet to lead them out just as he has done with his people in the past. This prophet will not be like the Christian prophets we are used to. He will come with power and authority like Elijah or Moses did to leave no doubt they were confirmed representatives of God. The big question is whether you will have the faith at that time to comply with the radical command to pick up and move. But if you know in advance, why leave it to chance? Work to Increase your faith now. Read the Bible more and and walk according to it. When you see God working in your life as you follow him and make the sacrifices he requires, you will build a relationship of trust with him like Abraham demonstrated in his commanded sojourns. With this kind of faith, you will be more than ready when the day to move comes and you will not be caught in America when she falls to fulfill that key and unmissable sign of the end that Jesus spoke of. Update: If you want to know why America's fall can't happen while Donald Trump is US president, read why Jesus can't come back this year. Great article as usual Tim! One item that I’m still struggling with lies in the ‘timing’ of WWIII in relation to the Middle East war. If WWIII takes place PRIOR TO the Middle East war that ‘may’ open up Isreal to immigration (like you’ve already stated). However, I keep wondering about the ‘catalyst’ which begins about the Middle East war (Isaiah/Psalm)—To me, it seems like an end to America could greatly speed up this process (either America doesn’t exist OR it’s power has been greatly diminished by internal struggle/economics, etc..). If this were the case then the problem would still exist for getting people INTO Israel (if America falls first)—In any case, I’m just having difficulty imagining a scenario where the ME countries group together (including Saudi Arabia, possibly Iraq, and others) and attack Israel IF the US is still somehow ‘in the mix’ (ie: exists OR has the ability to extend its military reach as it does today)…. Zachary, I don’t know why you have difficulty seeing a M.E. war with America around. The Arabs already banded together three times (1948, 1967, 1973) to try to take out Israel. America could send troops later, but if the Israeli army is defeated, it’s too late. It’s a tiny country and with WMDs can be defeated too quick for America to respond. Make sense? Anyway for sure, WWIII “Babylon has fallen” does not come until after things are set up in the M.E. for us to flee there, the Muslim control of the temple mount be removed for the 144,000 and for a temple to be built for the Antichrist. Perhaps a move by Israel to build the Temple on the Mount will trigger the middle east war. I know, Tim, that you talk about the Middle East war clearing the way for Israel to proceed with building the Temple, but Israel initiating such a project could stir up the surrounding nations in just such a way as is required for the psalm 83 war to occur. The Scriptures make it quite clear that it will be the other side of the current Syrian war that will invade Israel – Persia (Iran) aligned with Russia, Turkey, Libya and Sudan (modern day Ethiopia). A large component of the rebel forces trying to take down Assad come from North African countries like Libya and Sudan. Turkish forces are also aligned with these rebel groups. A possible scenario is that Israel supported by the US will take down the Syrian regime and destroy Damascus, after which the rebel forces will join forces with Russia to invade Israel. At the moment Putin is on the fence regarding Israel, but if he suffers a humiliating defeat in Syria, he may turn on Israel and use his forces to facilitate an invasion using the various jihadist militias as the footsoldiers, and Russia’s high-tech air force for air cover, as well as advanced Russian tanks and weapons on the ground. But we all know the end result of that war. The enemies of Israel will be defeated by Jesus Christ when He returns. Have you ever thought the following verse applies to the destruction of the USA? Your mother is Great Britain and it is a hindermost or later nation. Al, yes Jer 50-51 and Rev 17-18 are parallel prophecies about America whose chief greatest city is NYC. 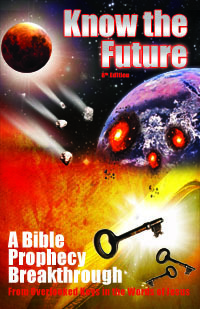 See this exhaustive article for all the info on all the America prophecies in the bible. I have been reading your articles but this one is quite unique and it makes all the sense. God loves His people so much that He sends a prophet to warn them. It has happened before and it will happen again. I believe the time to get out of America is now, I had a word of knowledge from God about 3 days ago but did not know what it meant until I came upon this site, but how God does it we have to wait and see, If he wants his people out he will create scenarios to force us out if we are unable to go readily. How much time does God give us after his warning is difficult to predict, but maybe a gradual shift maybe. now is not yet the time of Revelation 18:4 fleeing from America. Instead, nearly all need to wait for the voice from heaven and God’s provision and leadership to do so. The temptation is for people like me in Australia, to think I don’t have to move anywhere. I am under no illusions however. When the beast comes for what remains of the Christians, it will be a global move. That’s what Jade Helm was all about – a global AI system whereby all of Babylon’s forces will be co-ordinated in one massive swoop to try to capture or kill resistance to the global beast regime wherever they may be. I don’t believe in some kind of limited “escape from America” scenario. I believe in a global rapture escape scenario. For those who are too worldly to believe that God will deliver what he has promised in His Word, I pray he will be gracious and allow all who believe in His name to be raptured regardless. AusKiwi the locusts from the pit will be the ones that force people to take the mark otherwise they die after 5 months or 150 days of torture. Of course in God’s safe zone you won’t have to worry about the mark or the locusts. Really raptured? Can you provide these scriptures that he’s promised this? I DO HAVE A QUESTION THO FOR TIM. What is your thoughts about all the Christians around the world and not just USA? Why is this prophet only coming to the US? Angelique, the prophet will warn America, yes, but also all the world. I enjoy reading your viewpoints but I think you are missing it when it comes to “Babylon is fallen, is fallen.” Babylon is a city in Revelation 17 and 18….Not an entire nation…. We are talking scores of millions of people leaving a “nation” when as you say the prophet of the Lord tells His people to come out of her. When I do a word study on “city” i.e. Rev. 18:10 “that great city” all my word study sources say the Greek word is “polis.” And they all define it as a city not a nation. With all due respect, I think this fact is important to the correct interpretation and understanding of chapter 17 and 18 of Revelation. John, nothing missed here on the city point. NYC is the chief/greatest city of America and stands for the nation of America in the prophecy. Just as recently Russia speaks of “Washington making a mistake” referring to Trump’s action on Syria, so too, NYC stands for America. Or you don’t really think Russia is going to strike NYC and not the rest of the nation at the same time to reduce the retaliatory strike? Thomas the same economy we’ve seen America have since the decline of the UK and ascent in WWII of America to the top of the worlds economies and militaries. America began fitting Revelation 18 ever since then and has not stopped and will not until Russia burns her in 30 minutes. I picture NYC, the harbor, Statue of Liberty as representing America. A few years ago I was driving into Long Island and encountered a sign that read “Welcome to Babylon”. There is a town or city in view of the above that is named Babylon, that was enough to further convince me..
Anton, you can read my comments here on the soon-to-be-in-the-trash-heap September 2017 / Revelation 12 prophecy theory. What if the Vatican is the city on the hill? St. Peter’s. Templum Vaticani ? Kathy, the Vatican is the city on seven HILLs. But Revelation says seven MOUNTAINS using a different Greek word as this link shows. Bro’ Tim, in taking things so literal, how do you answer Revelation 1:1-3 which clearly says the things in the book were “at hand” and “near” to the original readers? Greg, (good to hear from you). “Soon” and “near” are not absolute or objective terms. They are relative and subject to who is speaking and what their perspective is, i.e. how they’re using the words. 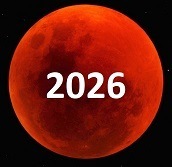 From the writer’s infinity perspective, 2000 years is soon. Since it can be demonstrated that the bulk of Revelation has not taken place yet (try fitting Rev 6:12-17, a plain literal prophecy, into historic events), it must be that God meant “soon”/”near” from his eternal perspective. If “the Beast” arises and the tribulation begins shortly after America is destroyed, why would believers go through the trouble of “moving out of her” (America), whose destruction will be very swift, to then only face the horrors and prolonged torment of the tribulation, the beasts rule and then ultimately be martyred anyway? Are we really suppose to run and save ourselves, escape the coming troubles, when, in fact, many Christians throughout history went through persecution, death and most apostles were martyred. Susan, multiple verses tell us leave no doubt as far as the end times go, it is God’s will we “come out” to “survive” and “escape” (Rev 18:4; Joel 2:32; Lk 21:36) and not (all) be martyrs (Rev 6:11). There is also a clear plan in the Bible for God helping us do that through gathering us to a special place on earth prepared to keep us (Joel 2:32; Rev 12:14). Those who don’t listen (most Christians) will indeed be martyrs as you pointed out is an ever present reality of believers in Satan’s world. Hello Tim. It’s been a LONG time since I have communicated with you (5+ years maybe??) I posted many, many times on your forum as Pauled. I want to let you know that although I have been “silent” I still read all of your new material and truly appreciate your wisdom and sharing of prophecy with us! I know it’s been a while since I posted but it’s amazing how much my concept of prophecy has changed over the years, I was like many of your viewers, absolutely convinced that the “end” was upon us (and that started 20+ years ago!). Thankfully you helped me to understand that many things have to pass before the trib begins. For starters, you convinced me a long time ago that the pre trib rapture is a fallacy and I thank you for that. I live here in the USA and following the current world events closely, I am fascinated. Here is what I am struggling with: Rev 8:7 mentions a 1/3 of the earth being burned up. I’ve always taken this to mean a nuclear attack of sorts but DURING the tribulation not prior to. So what I struggle with is the timing of this event- you seem to think the destruction of the US takes place prior to that. My calculations show that North America + South America equals approx. 1/3 of the world land mass (about 30%) but that would include far more countries than just the US, we would be talking about Canada, Mexico, central America, and all of South America. Your thoughts?? Your articles are very fascinating. I would like to know how America fits into Rev.17:6 & Rev 18:24. Secondly, how do you explain Rev.17:16 in relation to the theory that ‘Babylon’ will be destroyed by Russia. Israel, that verse objection is addressed here. Where are we suppose to go? If we are called to “come out of her”, where do we go? It sounds like we will need passports and plans to get out which can certainly take time to do even if we leave with bare necessities. Mama, God does not give commission without provision and a plan. Tim, through reading your articles I have learned, among others, to pay close attention to “cognitive dissonance” something that is rare and usually easily cleared up in them. Maybe it is because I feel that it might be also possible for the Russia/China alliance to eventually hack the DoD computer systems and freeze the M.A.D. response long enough for a successful first strike nuclear assault, but it is hard for me to fit the merchants in anguish over the loss of trade with America, during the beginning onslaught of Wormwood when which is what would enable the Russians and lead them to discount an economic collapse. I mean it seems the merchants of Rev. 18:11 are oblivious to TEOTWAWKI which has already begun if the Russians are to wait for this opportunity, which makes sense, its just the attitude of the merchants who are distracted by the loss of the “almighty” usdollar yet unaware the Wormwood events have already kicked in… therein my cognitive dissonance. Thomas, interesting observation, but does not bother me. When the Bible tells stories or teaches points through characters, I don’t ever see them incorporate the whole big picture. Jesus’ parables are exactly this way if you look at the ones teaching about the rapture no mention where people are gathered before or “the one taken and one left,” no mention of the mark or the Antichrist. Rev 18 seems to be no different. Either the focus of that chapter is on the loss of America and the economic collapse that results as told through the reaction of the merchants without regard for Wormwood coming next, or I’m wrong and somehow Russia takes out America without the distraction of Wormwood. I can see the former possibility based on Bible stories being incomplete (on purpose) and needing to be threaded together, but still have no alternate to the latter on how Russia possibly takes out America when there is so much to lose and chance of defeat in attempting that. This also resolves another cognitive dissonance issue for me I mentioned to you some ten years ago about my not getting over how the overseas components of the US Military ie NATO bases such as that near your current home, particularly those with nuclear weapons, figure in with the destruction of our US homeland. Back then as I remember it you responded that you figured overseas military units would immediately disband not be an effective strategic response. OK I thought then, sure that would the case for a lot of vulnerable land based units, but how about nuclear armed and autonomous nuclear powered aircraft carriers and submarines? Well, your understanding about the burning of America having to coincide with the onset of the Wormwood events covers that issue nicely for me also since as you pointed out even unused Russian nuclear arms would soon be rendered useless with these Revelation events kicking in… so much the more so for the overseas remnants of the US military! Hi Tim. Since you recently modified your perspective of the apearence of Wormwood being a coverup to litteraly appearing from nowhere after the trumpet (hence why it cant be seen on infrared) how does this affect Russias motivation and timing of their strike in your view? Will it come before wormwood becomes.apprent to the world or shortly before? Since it cant be on anyones radar at the moment (wormwood coming from another diminsion ie heaven) is there another motivation for Russias strike? Matt, it is as before: it can only come after Wormwood appears. Everyone is reacting to Wormwood and Russia does so in a sinister way. Hi Tim, I am fairly new to your site and have ordered two of your book. I have always been interested in “end time prophecy” teachings but was taught to “search the scriptures” and try or test what is from God along with anything I was taught by man. Everything you have shared so far seems to line up with what God has revealed to me through confirmation of scriptures, and recently ones concerning being part of the “remnant” and being called to “come out from among them”. I am interested specifically about the warning for America and it’s possible soon destruction because of “Wormwood/Russia”. Can you give me anymore insight as to the timeline of the warning of “Elijah” and preparing for the coming “WWIII”! I’ve read most of the above article but want to make sure I didn’t miss something. I want to support you and your work as the Lord leads but want to read your book first! Ron, (Thanks for your support). I have this article on Elijah’s coming that should help you with your questions. Beyond that, as as supporter you will have access to the Good News of the Kingdom study which is the first sign of the end (Mt 24:14) that Elijah will be involved with. Those should inform you well and put your mind at ease about the warning which you won’t be able to miss but may want to get ahead of now by learning and considering the 10+ obstacles awaiting all who hear the warning. The ME countries banding together to fight Israel is not so far-fetched. Just last summer the ME states proposed a peace treaty with Israel (which wasn’t signed). A false peace treaty between the ME states and Israel is in Revelations. 3 1/2 years into the treaty is when Israel is attacked. Search “red heifer” online. Israel hasn’t built the temple yet because they need a red heifer from Israeli stock for a purification sacrifice first. There was just one born so that process may begin soon. In 2013 I had visions (Biblical). Some have come true already and some are seeming more likely each day. The Bible says many will have these visions. I believe that the Pope and his entourage will die in a place bordered by two rivers. I believe this refers to Iraq/Mosul (modern-day Mesopotamia) where a tall cross was erected when Isis was driven out. This parallels one of the Secrets of Our Lady of Fatima. All of these things are Biblical. I believe the US and Israel are the two countries that make a stand against the world (Biblical). I don’t think God would let either be completely destroyed as the last defenders of Christianity and Judaism. The fact that you are reading this, trying to live right, reading the Bible, and praying show that you are likely not one of the non-believers that will perish. God reveals himself to those who believe, try to live rightly, and who search him out. Keep doing what is right in God’s eyes and, even if you perish, God promises his faithful everlasting life! Hi, I’m from Russia, at the beginning you mentioned that you love prophecies. I, too, love prophecies and want to give you advice. Never make final conclusions based only on your country’s forecasts. In fact, if you analyze forecasts from different countries, you will notice how they gradually intersect with each other and begin to make a more complete picture. Moreover, never treat your country favourably ( something like: all countries are bad, and my country is good), because it will really interfere with the analysis of events. Good luck! I want to add something if you’re interested in wormwood. Maybe you will be interested in what people think on this account the people of Russia, Ukraine, Belarus etc. Do you know the tragedy of Chernobyl? The matter is that wormwood has one more name “Chernobyl” and many connect this event with biblical because the station really poisoned water and the earth. What you think? Other thing. You say, “Russia will attack the US,” but will it really be so? Are you absolutely sure that the US will not declare war on Russia? (I don’t want to do good from my country, and from the US-evil, but also unfounded claims that Russia will attack someone, I will not ignore) Just I already have some understanding of what should happen, and from the us or any other country to do “innocent sheep” – stupid. Passer, Chernobyl was not a “star falling on the earth.” Why would the US attack Russia? Tell me what other nation can destroy America and would attack “from the north” and by the way has leaked plans to destroy America with a leader who boasts he can destroy America in 30 min?